We are watching the fall of Islamic theocracy in Iran. I don’t mean by this that the Iranian regime is about to collapse. It may—I certainly hope it will—but repressive regimes can stick around for a long time. We are watching the failure of the ideology that lay at the basis of the Iranian government. The regime’s founder, Ayatollah Ruhollah Khomeini, laid out his special interpretation of political Islam in a series of lectures in 1970. In this interpretation of Shia Islam, Islamic jurists were presumed to have divinely ordained powers to rule as guardians of the society, supreme arbiters not only on matters of morality, but politics as well. When Khomeini established the Islamic Republic of Iran, this idea, velayat-e faqih, rule by the Supreme Jurist, was at its heart. Last week that ideology suffered a fatal blow. When the current Supreme Leader, Ayatollah Ali Khamenei, declared the election of Mahmoud Ahmadinejad a “divine assessment,” he was using the key weapon of velayat-e faqih, divine sanction. Millions of Iranians didn’t buy it, convinced that their votes—one of the key secular rights allowed them under Iran’s religious system—had been stolen. Soon Khamenei was forced to accept the need for an inquiry into the election. The Guardian Council, Iran’s supreme constitutional body, promised to investigate, meet with the candidates and recount some votes. Khamenei has realized that the regime’s existence is at stake and has now hardened his position, but that cannot put things back together. It has become clear that in Iran today, legitimacy does not flow from divine authority but from popular will. For three decades, the Iranian regime has wielded its power through its religious standing, effectively excommunicating those who defied it. This no longer works—and the mullahs know it. For millions, perhaps the majority of Iranians, the regime has lost its legitimacy. Why is this happening? There have been protests in Iran before, but they always placed the street against the state, and the clerics all sided with the state. When the reformist president Mohammad Khatami was in power, he entertained the possibility of siding with the street after student riots broke out in 1999 and 2003, but in the end he stuck with the establishment. The street and state are at odds again—the difference this time is that the clerics are divided. Khatami has openly backed the challenger, Mir Hossein Mousavi, as has the reformist Grand Ayatollah Hussein Ali Montazeri. Even Parliament Speaker Ali Larijani, not a cleric himself but a man with strong family connections to the highest levels of the religious hierarchy, has expressed doubts about the election. Behind the scenes, former president Ali Akbar Hashemi Rafsanjani—the head of the Assembly of Experts, another important constitutional body—is reportedly waging a campaign against Ahmadinejad and even possibly the Supreme Leader. 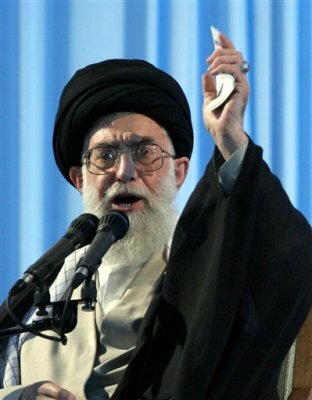 If senior clerics dispute Khamenei’s divine assessment and argue that the Guardian Council is wrong, it would represent a death blow to the basic premise behind the Islamic Republic of Iran. It would be as though a senior Soviet leader had said in 1980 that Karl Marx was not the right guide to economic policy. The Islamic Republic might endure but would be devoid of legitimacy. The regime could certainly prevail in this struggle; in fact, that would have to be the most likely outcome. But it will do so by using drastic means—banning all protests, arresting students, punishing senior leaders and shutting down civil society. No matter how things turn out—crackdown, co-optation—it is clear that millions in Iran no longer believe in the regime’s governing ideology. If it holds on to power, it will do so like the Soviet Union in the late Brezhnev era, surviving only through military intimidation. “Iran will turn into Egypt,” says the Iranian-born intellectual Reza Aslan, meaning a regime in which guns, rather than ideas, hold things together behind a façade of politics. The Islamic Republic has been watching its legitimacy dwindle over the past decade. First came Khatami, the reformist, who won landslide victories and began some reforms before he was stymied by the Guardian Council. That experience made the mullahs decide they had to reverse course on the only element of democracy they’d permitted in Iran—reasonably open elections. The regime’s method of control used to be to select permissible candidates, favor one or two, but allow genuine, secret balloting. In the parliamentary elections of 2004, however, the Guardian Council decided that normal methods would not achieve acceptable results. So it summarily banned 3,000 candidates, including many sitting parliamentarians. Because public support was even less certain this time, the regime went further, announcing the election results in two hours and giving Ahmadinejad victory by such a wide margin that it would preclude any dispute. Khamenei revealed the strategy in his sermon last Friday. “A difference of 11 million votes—how can there be vote rigging?” he asked. In his Friday sermon, Khamenei said that the United States, Israel and especially Britain were behind the street protests that have roiled Tehran, an accusation that will surely sound ridiculous to many Iranians. But not all: suspicion of meddling by outside powers is deeply ingrained among even the most Westernized citizens in Iran. The fact that Obama has been cautious in his reaction makes it all the harder for Khamenei and Ahmadinejad to wrap themselves in a nationalist flag. Neoconservatives are already denouncing Obama for his caution. Paul Wolfowitz, deputy defense secretary under Donald Rumsfeld, has compared the White House reaction to Ronald Reagan’s reticence when Ferdinand Marcos’s regime was challenged on the streets of the Philippines. But the analogy makes no sense. Marcos was an American client—he was in power courtesy of the United States. The protesters were asking Reagan to withdraw that support and let events take their course. Iran, on the other hand, is an independent, fiercely nationalistic country with a history of British and U.S. interference in its politics and economy. Britain essentially took over Iran’s oil industry in 1901; the United States engineered a coup in 1953. The chief criticism of the Shah of Iran was that he was an American puppet. As in many such countries—India is another example—this anti-imperial sentiment is quite powerful. Iranians know this is their fight, and they want it to be. The appropriate analogy is actually to George H.W. Bush’s cautious response to the cracks that started to appear in the Soviet empire in 1989. Then, as now with Obama, many neoconservatives were livid with Bush for not loudly supporting those trying to topple the communist regimes in Eastern Europe. But Bush’s concern was that the situation was fragile. Those regimes could easily crack down on the protesters, and the Soviet Union could send in its own tanks. Handing the communists reasons to react forcefully would help no one, least of all the protesters. Bush’s basic approach was correct and has been vindicated by history. But there is one statement that I wish Obama had not made. Discussing the events taking place in Iran, he said that there was no important difference between Ahmadinejad and Mousavi, since they would both defend the Islamic Republic’s key foreign-policy choices, from its nuclear ambitions to its support for organizations like Hamas and Hizbullah. That viewpoint has actually been voiced by some in the neoconservative camp who have openly preferred Ahmadinejad: a more threatening foe would more clearly highlight the dangers of the regime to the rest of the world. But even if this were true before the election, it is no longer true. Mousavi has become a symbol of change, anti-Ahmadinejad sentiment and even anti-regime aspirations. He is clearly aware of this and is embracing the support. A victory for him would mean a different Iran. Even during the campaign, what did Mousavi say that resonated most with voters? That he would do a better job on the economy? That corruption had gotten out of hand? Perhaps, but every challenger says that, and Mousavi didn’t really have many new ideas or an impressive recent record to make these claims credible. The theme that Mousavi constantly hit was that Ahmadinejad had isolated the country, engaged in an aggressive foreign policy and needlessly turned Iran into a pariah state. For many of his supporters, this was the key issue: they craved more engagement with the world, not less. Ahmadinejad’s willful rejection of the West and constant references to America’s supposed decline were insults to their ambition to be included again in the world community. President Obama could look at these events and simply say, “Iran has a proud and long history of being actively involved with the world, not being isolated from it. The world has long wanted to extend the hand of engagement with the Iranian people. Watching the elections and the remarkable, peaceful demonstrations that are ongoing, it is clear that the Iranian people also want engagement with the world. We hear your voices and wish you well.” That way, in a careful fashion, Obama could turn Iranian nationalism on the regime itself. But the real issue here is not a few words from Obama, but events on the ground in Iran. The faltering of the Islamic Republic will have repercussions all over the Muslim world. Although Iran is Shia and most of the Islamic world is Sunni, Khomeini’s rise to power was a shock to every Muslim country, a sign that Islamic fundamentalism was a force to be reckoned with. Some countries, like Saudi Arabia, tried to co-opt that force. Others, like Egypt, repressed it brutally. But everywhere, Iran was the symbol of the rise of political Islam. If it now fails, a 30-year-old tide will have turned. ← الجنّة الآن Paradise Now!